Columbus, Ohio (July 5, 2018) – Crystal Amesquita never expected to be in this position—recently incarcerated and struggling to find a job to support her 12-year-old son, Dominic. But everything was about to change. A program called Digital Works (DW) came into her life at the right moment and turned it all around. While staying at the Alvis House in Columbus, Ohio, Amesquita learned about DW from her case manager. Crystal Amesquita receiving her graduation certificate from Tammy Spring. 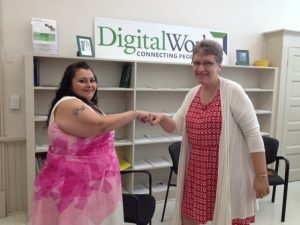 Digital Works is a program of Connected Nation that provides classes in basic digital literacy, customer service support skills, business and technical skills, and career readiness training. Amesquita attended the training at the Reeb Center location in Columbus, where a dozen nonprofits work together to meet the needs of the local community. According to Amesquita, DW’s staff provided her with an easy-to-follow training program. Her facilitators helped address questions or issues as they arose and made sure she performed to her fullest potential. 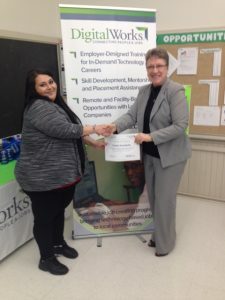 After a month of hard work, Amesquita graduated from Digital Works in mid-2018 and was the first one out of her class to get a job interview. She now works directly with customers helping them handle insurance needs and questions. She’s done so well in her new position that she was invited to speak with and encourage new students taking part in the life-changing program.